In October 2015, the elderly population of Matsuda Town is 31.3%, which means one out of three people are aged 65 or over. 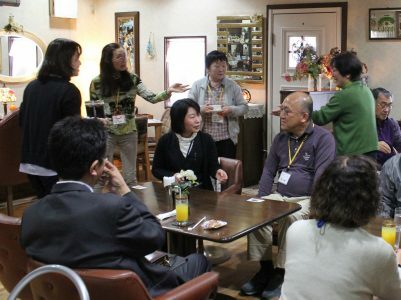 We are implementing various measures from diversified perspectives to realize a society where seniors can live safely and in comfort in their familiar surroundings, where each elderly can enjoy their unique life with pride and the feeling of independence. With this in mind, we created a vision of “Matsuda – a town full of cheer, tenderness and respect to seniors” as our fundamental policy, based on which we promote ageing measures comprehensively and systematically, to achieve extension of residents’ healthy life expectancy. For seniors to age in place and enjoy their own lifestyles, it is important for them to feel their life meaningful, to be able to live longer by managing their ailment and improving their ME-BYO conditions. However, recent social trends make it more difficult to support seniors only with public services. Community support and help for seniors are highly needed. In this super-aged society, we should target our support and care not only to certified care recipients, but also to other seniors, meeting their diversified needs. Also, we should promote measures to maintain and upgrade seniors’ physical and mental conditions. We are determined to create a community where everyone, including seniors, can live together and support each other harmoniously. (1) To ensure safe and comfortable daily life of seniors in community, we will promote good coordination among healthcare, medical and welfare services given to them. For this purpose, we are establishing a community-based integrated care system, which functions with a regional integrated support center as a core. (2) We will upgrade our preventive nursing care to keep seniors from becoming bed-ridden, or falling into the status constantly needing support and care. To enable this, we will develop preventive nursing supporters, dementia prevention supporters and life-assistance supporters, as an integral part of our regional support network. (3) We will build a system where seniors can have something to live for, can become socially active in their own way. We will invite willing seniors with skills and experiences to join in the community activity network to utilize their expertise. (5) To protect the rights of dementia seniors, we will build a community network to prevent abuse to seniors, and to detect early signs of abuse. We will disseminate various information on protection of seniors, including adult guardianship. (6) We will call for community people to watch over seniors living alone, and call to them whenever they need help. To prepare for emergency such as disasters, we will establish an emergency network to ensure seniors to escape safely.